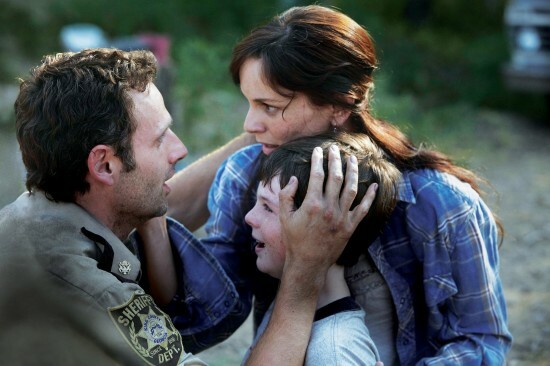 Returning to the camp with the department store survivors, Rick has an emotional reunion with his wife and son. Soon afterwards however, despite encountering a walker near camp, Rick decides to go against Shane's advice and go back to Atlanta for Merle Dixon and his dropped bag of guns, intending to retrieve the walkie-talkie left in the bag in order to warn Morgan against going to Atlanta. He is accompanied by Merle's upset and distrusting younger brother Daryl Dixon as well as Glenn and T-Dog. Lori warns Shane to stay away from her family now that Rick has returned – a surprise, since Shane had told her Rick had died in the hospital. Tensions run high in the camp between a woman, Carol, and her abusive husband, Ed. A fight breaks out, during which Shane takes out his anger on Ed by nearly beating him to death. The rescue team makes it to Atlanta and, once they are on the department store roof, they discover a hacksaw, Merle's dismembered hand, blood on his handcuffs, and that he is nowhere to be found.